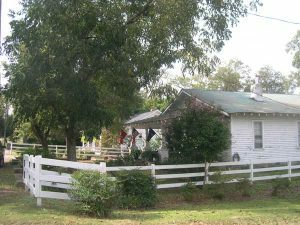 The ramble goes down Wigfall, one of the coziest of street in Edgefield, that includes a bridge over Beaverdam Creek, “trimmed” with Chinese bamboo; a number of bungalows, and some history of interest to everyone. Here is a view of two bungalows that speak to the coziness of the street. The Edgefield Advertiser is celebrating the 11th Heritage Jubilee Festival with an 18-page special edition that includes 6 pages dedicated to Edgefield, its people, and the spirit of the festival that brings so many former residents and present ones together. Readers will find a ramble that takes one down Wigfall Street, a cozy neighborhood of bungalows and Chinese bamboo and interesting history – told by Owen Clark with pictures of the homes. There is a celebration of the Edgefield Square in a pictorial account of the chock-full past weekend that saw over a hundred guests coming into Edgefield for the Southern Studies Conference that is likely to become an annual affair. And then on Sunday Mt. of Olives church came to town from Martintown Rd. to bring their service out in the open at the foot of the Courthouse stairs. These are the unusual stories that this edition brings: the usual stories are found in the everyday lives of our citizenry as told by our community correspondents and our page two writers on religion, humor and gardens. The Edgefield Advertiser is a community newspaper which is available by subscription and in stands at convenience stores throughout the local area. Have a great read and join the subscribers if you are not already one.